Journeyed up to the Sandspit River, just South of Rheban, earlier this week. I haven't visited the area in several years and I was quite surprised at the changes to the river mouth. If anyone has any doubts about global warming and the effects that is having, here might be a good place to start. The dunes on the South side have all but disappeared and much of the bank edging Earlham Farm has been undermined. While I was there an inhabitant of the small coastal village was placing rock on the shore to at least slow the erosion of his property. But you may ask, what about the birds! 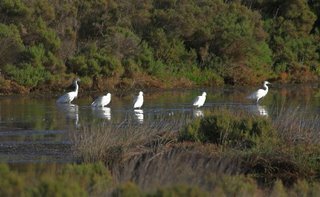 On the approach to the small coastal community, through the Earlham property, there was many Eastern Rosellas, and a few Green Rosellas, numerous Musk Lorikeets, a flock of Welcome Swallows hawking the paddocks, White-faced Herons and the usual Magpies, Miners and Butcherbirds. At the river mouth there were several Red-necked Stint (only one showing any "colour"), 4 Double-banded Plover, c.25 Red-capped Plover and a pair of Hooded Plover (pictured). 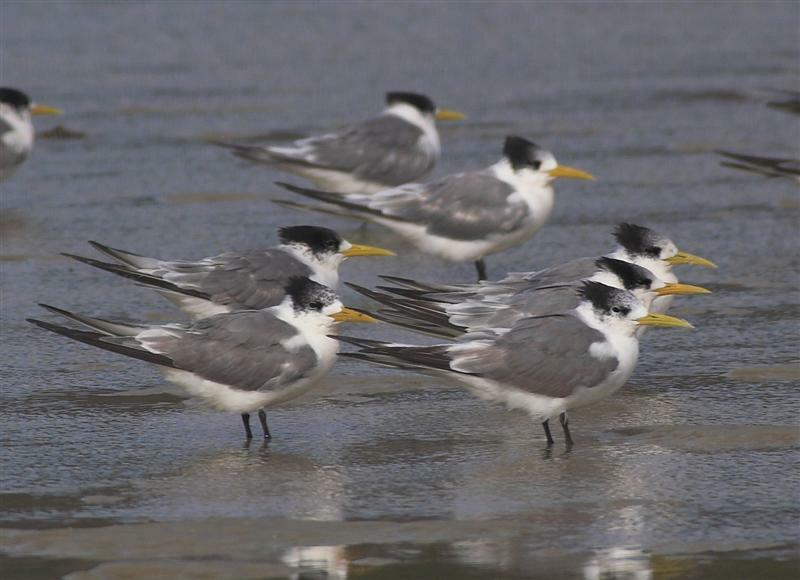 I found only 3 Pied Oystercatcher, who spent most of their time playing chase, a few Pacific Gulls and a flock of around 30 Crested Tern (some pictured), of which at least 5 were carrying bands. I spent sometime watching the Hoodies among the many Soldier Crabs,(see top pic) mainly because I have seen them eat them in the past. Obviously Soldier Crabs are low on their list of preferred food, as after watching for 30 minutes or so, they didn't show any interest in them at all. Presumably these crabs shed their 'skin', and go through a 'soft' shell stage, at which time they might be more appealing! 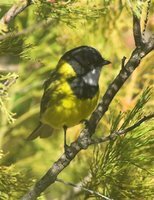 John Tongue writes: It's interesting how we come to associate certain birds with certain locations--probably where we see them most, or have particular memories. There is a road near my home town in NSW where you can almost always see Torquise Parrots, and so I come to associate them with that place in my memory. 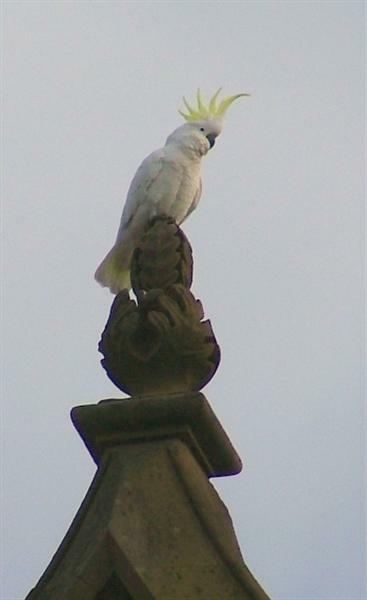 In Tassie, I think of White Cockatoos at Epping Forest, or Claremont, or even Cornelian Bay most recently. 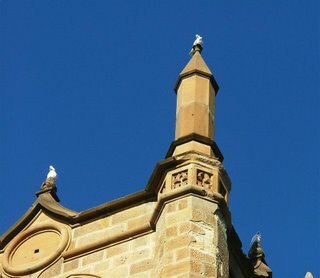 I am the rector at Holy Trinity Church (Nth Hobart), and with the church tower, I think of Ravens, or sometimes Eastern Rosellas, but the last couple of days has seen an influx of up to 55 or 60 Sulphur-crested Cockatoos. They've been raiding nearby walnut, eucalypt, and Norfolk Pines (?) for food, and many of them perch all over the church tower, as the accompanying shots show. Unless they are just passing through looking for new food sources, we might have to come to associate them with the bell tower as much as we do Ravens! Well perhaps partially solved! Ever since I posted a piece on mussel eating Oystercatchers, I've had a slight worry that, perhaps, that wasn't the entire truth. Certainly, at times I've seen them chisel away at the mussels, but that wasn't what my recent observations on them suggested. 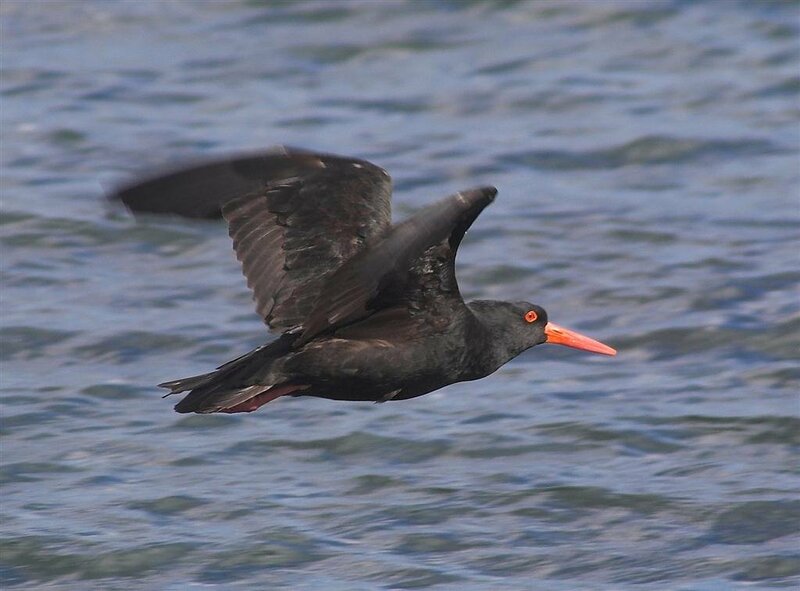 While photographing some Sooty Oystercatchers this morning, I 'shot' one with something in its' bill. On putting the image into the edit programme and enlarging it (see pic), I realised it was a small crab. 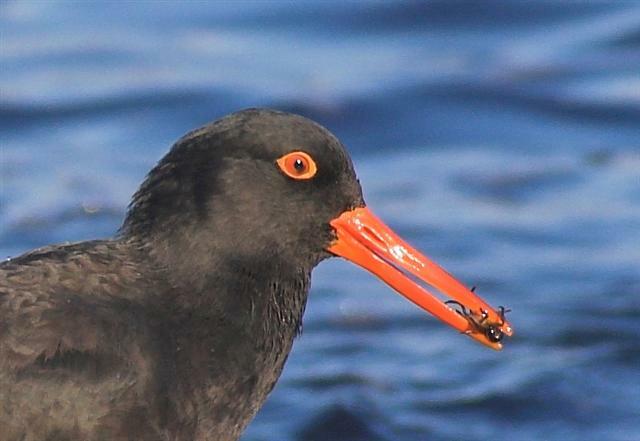 Any fisherman using mussels for bait, would know that each mussel contains a small crab--I assume it spends its' entire life in the shell (perhaps someone could enlighten me)--and that would appear to be what the Oystercatchers are after,( although it is also possible there may be small crabs secreted among the mussels). 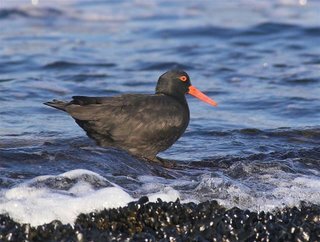 There would appear to be some advantage to the Oystercatcher to feed in the wash (see pic), as at that time the mussels open, and allow a smart bird to gain access to the crab. I'm sure that's not all their feeding on-- better keep watching! think that such actions by them are appropriate. 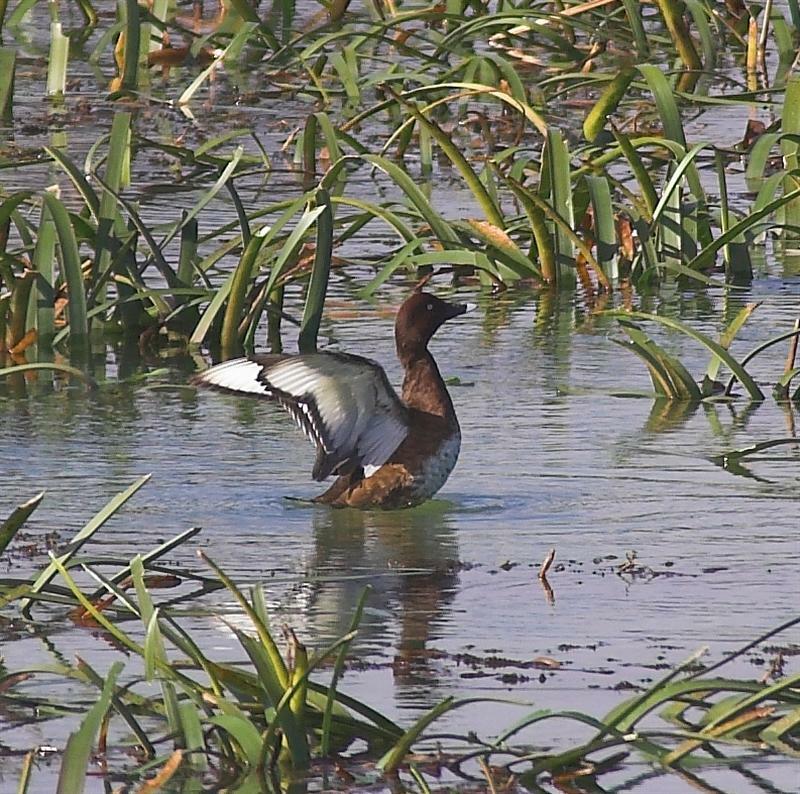 Despite all the above, there was still a large number of ducks on the main lake, protected by the boggy areas surrounding the small area of water. Present were c.250 Chestnut Teal, c20 Grey Teal (first I've seen for sometime), c30 Mountain Duck, 40+Black Swan, 5 Double-banded Plover, c.40 Red-capped Plover and on the dammed section, 5 White-eyed Duck hidden in the depths of the vegetation, one of which I managed to photograph (distantly--but shows the distinctive white underwing) and an assortment of Black/Mallard Duck, and even a few 'real' Black Ducks! The increasing numbers of hybrids is very disappointing to see. I'm not really sure whether I had a good morning!! 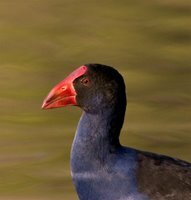 Bill & Els write : While doing some photography on a farm dam North of Richmond (in late March), a couple of Little Grassbirds began to skulk along the edge of the reed beds, followed later by a Dusky Moorhen which also hugged the edge of the reeds. Despite a three hour wait, none of the above ventured anywhere within the range of our lens. 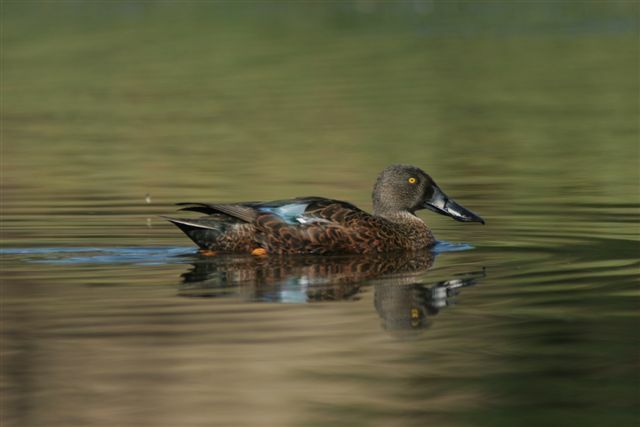 Almost having given up hope, there was a flapping and splashing rapidly approaching the hide, which in fact turned out to be a beautiful male Blue-billed Duck. I had no idea this bird was on the small dam as it must have been hiding either in the reed mace or lying low amongst the Triglochin. After a few shots, the bird moved away, suspicious of the shutter noise. 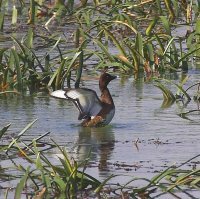 The birds' presence, signalled the arrival of several other species of wildfowl, allowing more rather nice images to be obtained. I had wondered whether the presence of a Little Falcon, in the tree above the hide, might have deterred other birds from approaching my hiding place. A very productive day resulted. John & Shirley Tongue write: Lyrebirds were introduced into Tasmania's Mt. Field National Park in 1934, and to the Hastings Cave district, in 1945. We have heard reports of sightings at Mt. Field, but have not experienced them ourselves, though the 2005 Tasmanian Bird report cites a 2003 sighting at Lake Gordon as "an extension to its' current range". However, they seem to be flourishing in the Hastings Caves district. On a drive along the Forest Rd. 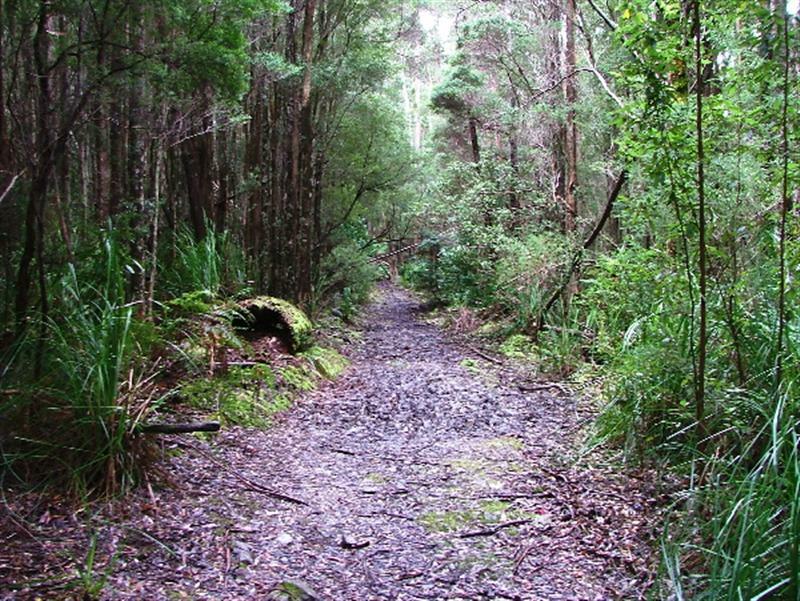 between Hastings Cave and Duckhole Lake in 2003, we saw 6 individuals either in the forest, or dashing across the road.Then today (Thursday), while walking the old Lune Railway formation, which is now the walking track into Mystery Creek Cave, we heard 3 individuals calling in a very hearty fashion. 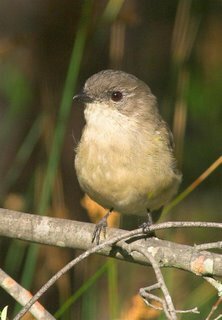 As well as their own distinctive calls, these birds mimicked, Kookaburras, Black Currawong, Grey Shrike-thrushes and Green Rosellas. Sadly, no bird wanted to show itself for a photograph, though there were signs of their scratching everywhere along the sides of the track, not really obvious in the accompanying photograph. 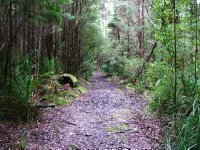 Presumably, the Superb Lyrebird will continue to expand its' range where suitable rainforest/ dense wet sclerophyll forest habitat is available. 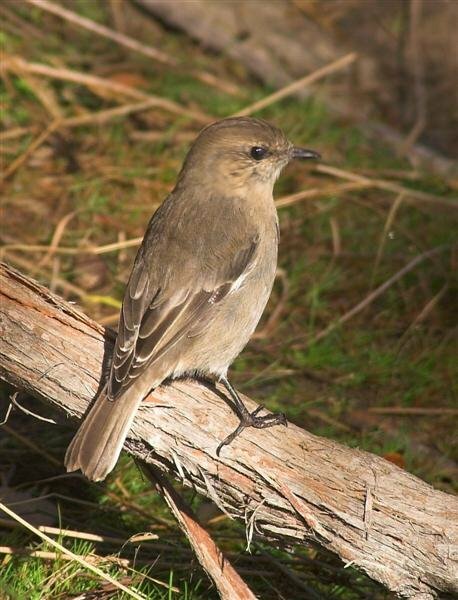 Hopefully this will not be to the detriment of native Tasmanian ground feeding species, such as the Bassian Thrush--which did give us a fleeting glimpse today. 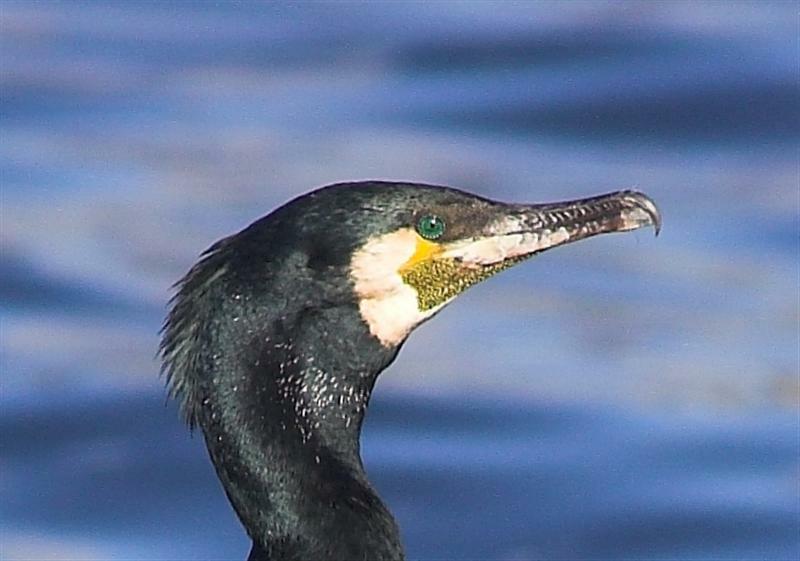 Over the last few weeks, I seem to have photographed a considerable number of Cormorants. Without exception they have been Black-faced and Little Pieds, at least until earlier this week. 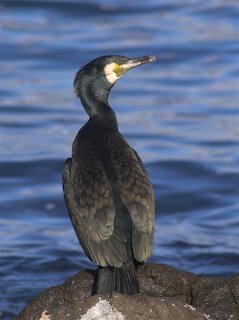 While walking along the Howrah coast, I came upon a group of roosting birds, including this one and only Great Cormorant. Surprisingly, this is the first one that I have been able to approach close enough to photograph. Looking at the images on the computer, I was struck by the face colours, I obviously hadn't taken much notice before, probably dismissing these cormorants, as not particularly worthy of further inspection. The Great, Black or Common--it seems to have had several names over the years--seems to bring out the worst in some people, from my observations over the years. 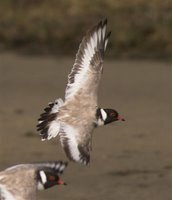 They are regularly shot at, and their nests destroyed, even I might say, in National Parks ( I have witnessed fishermen doing this). But this persecution is not new. In John Gould's "Birds of Australia", published in 1865, he comments: "I killed several while perched on the high gum-trees"... and goes on "It is, however, so shy and wary that it is difficult to get within shot of it". I guess at least he was (I assume) collecting for science! 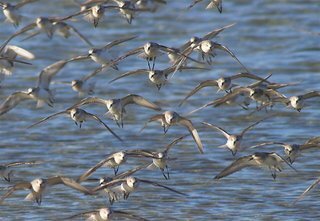 At times, large numbers (hundreds) descend on the Derwent Estuary. 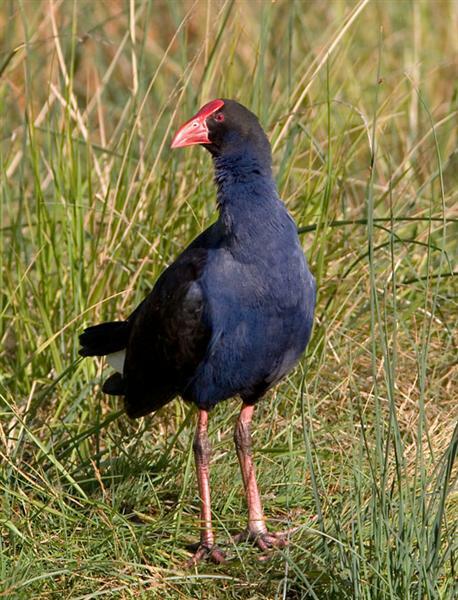 It is generally believed these birds emanate from the Mainland, sometimes starting calls for a bounty on them to be introduced. Investigations have shown that Great Cormorants feed on a wide variety of aquatic vertebrates and do little damage to fisheries, but long held beliefs will take a long time to change. 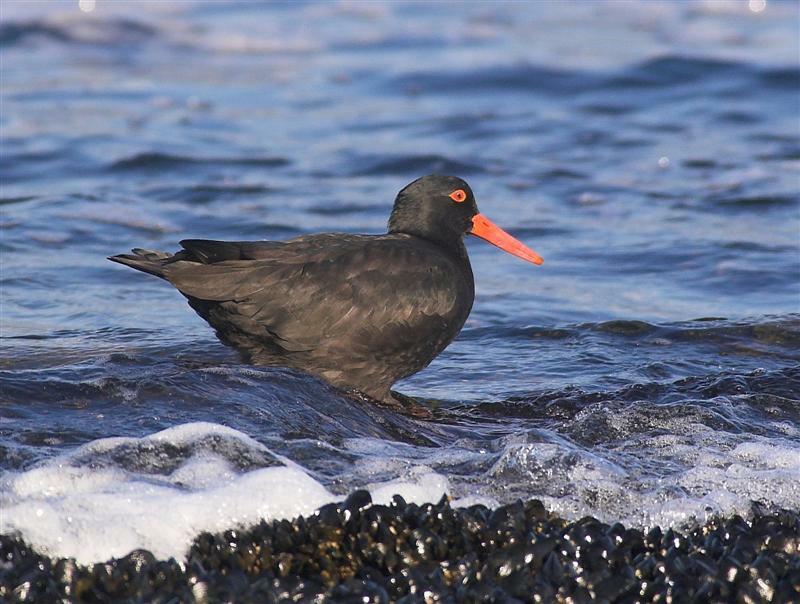 there has been a large influx of Sooty Oystercatchers into local bays and lagoons. 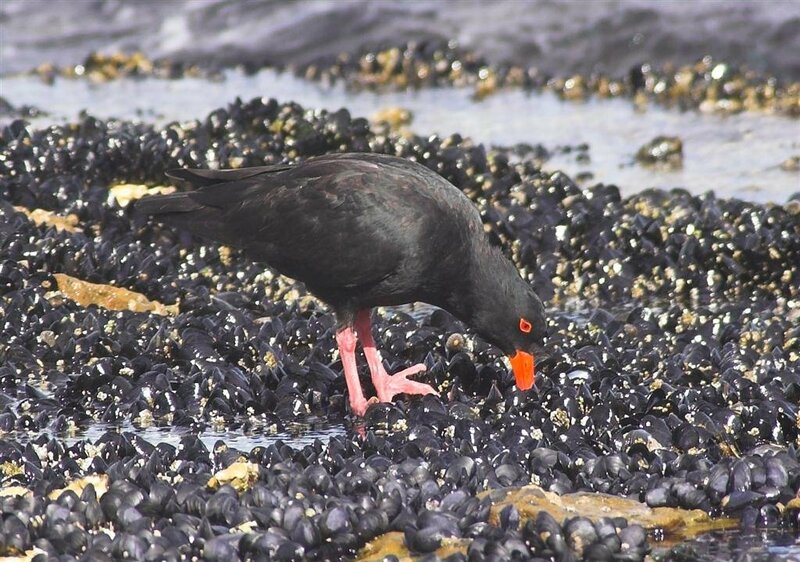 Unlike their Pied cousins, the Sooty Oicks prefer the rocky coast line, where they feed among the kelp and mussel covered rocks. Finding their prefered sites and roosts denied to them, they have sought shelter in other areas. 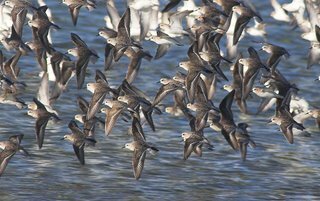 In Pipeclay Lagoon this morning, there was over 50 Sooty among the 100 or so Pied, and South Arm Neck held c.30. There has also been a noticeable increase in the numbers feeding on the rocks at Bellerive, where these shots were taken. 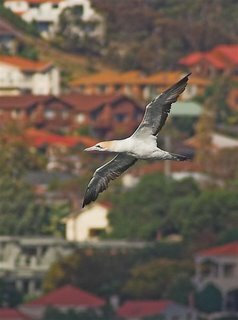 The gusty North Westerly winds that we've been experiencing around the South today, brought a number of Australasian Gannets well up the Derwent River, certainly as far as the Tasman Bridge. 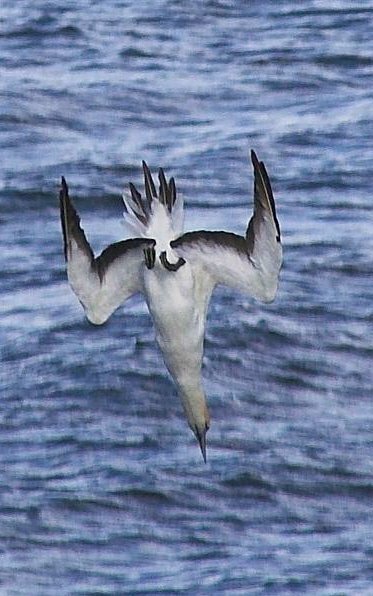 I watched several from the Second Bluff at Bellerive, as they quartered the waters off Howrah and Bellerive Beaches, occasionally finding their prey and making spectacular dives from 20 metres or so. I couldn't determine their success rate, or whether they were after fish or squid, but judging from the length of time they were underwater, I would assume their prey was fairly deep in the water. 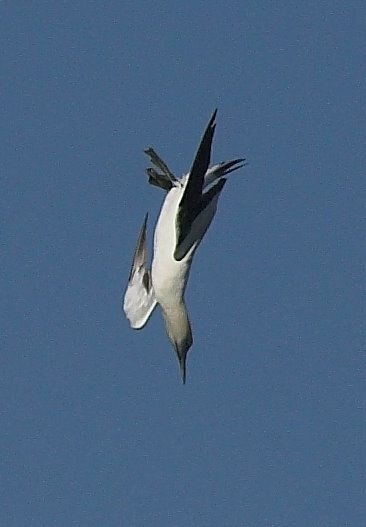 I have observed Gannets fishing in both hemispheres, but never tire of watching them. (All these shots were taken of birds off Howrah). Made a quick trip down to Marion Bay on Monday. I had expected to see huge quantities of seaweed washed up on the main beach, after the storms, attracting birds. As it happened the beach was as clean as I have seen it, although there was substantial amounts on the 'inside' shore, but apparently of no interest to birds. I thought I had made a reasonably early start, but met 2 birders (who live locally) just leaving! 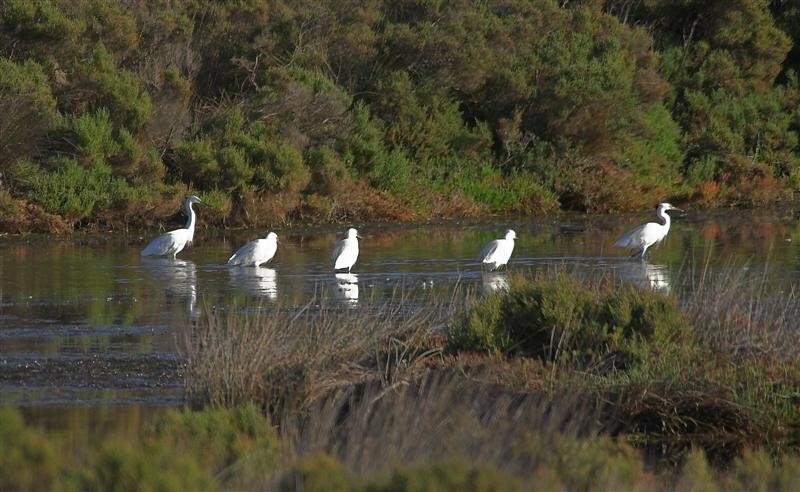 We had all stopped to watch the 5 Little Egrets feeding in the creek on the North side of the causeway (see pic). We talked a while (har d to stop birders talking!) 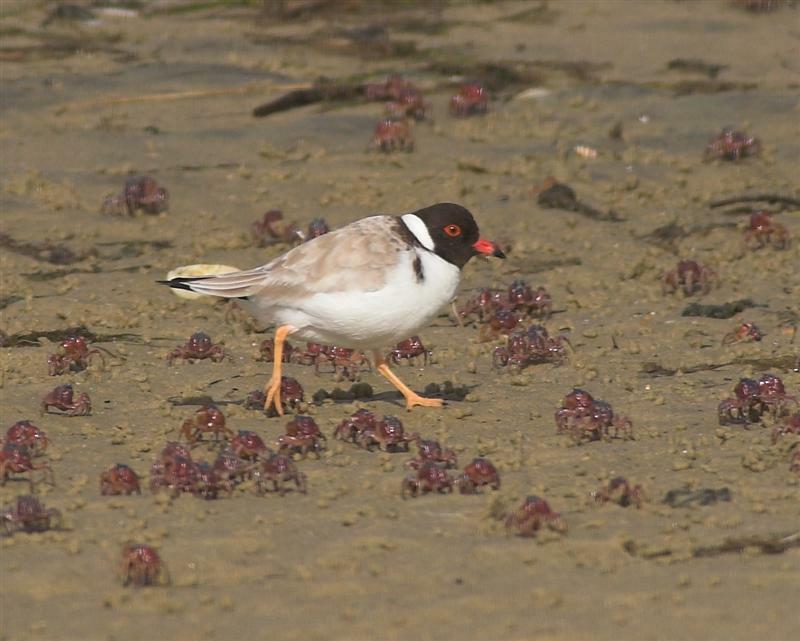 and they told me they had seen 2 Fairy Terns--a fairly late date--but I failed to find them. In Blackman Bay there were around 30 Bartails, 12 Greenshank, 30 odd Pelicans and numerous Pied Oystercatcher. On the ocean beach, there was precious little, except a flock of around 300 gulls, mainly Kelp and a few Pacific, nearly all adult birds. (They seem to flight between there and a waterhole along the road to Dunalle y, where they wash and brush up, before loafing in an adjacent paddock, which they were sharing with c 40 Wood Duck.) There were a few waders, around 20 Red-necked Stint and c12 Double-banded Plover, all very flighty, but I managed to photograph this solitary Red-necked Stint in fairly advanced breeding plumage. 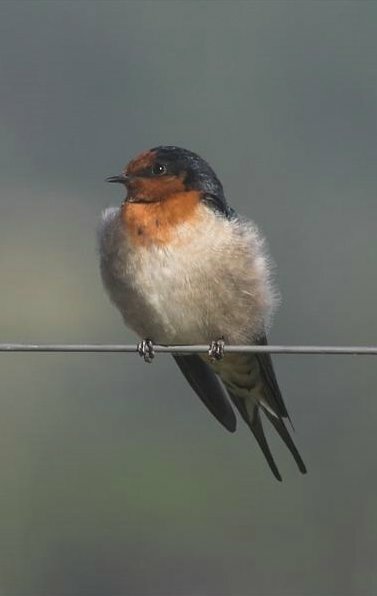 As I returned along the track, I noticed 2 Welcome Swallows sitting on the fence, all fluffed up to preserve body temperature, as you can see. They were hawking 'robin' style, watching for insects on the ground and pouncing, before returning to their wire perch. If they're to survive the Winter here, as many do, they will need to perfect that skill! On the debit side, there was evidence of recent activity by an ATV, several dogs and a pacing sulky. I also "chatted" a dirt bike rider, who assured me he wouldn't go on the beach. I saw him later, returning along the Dunalley road, apparently unregistered, and therefore, presumably uninsured! It's an ill wind that blows no one any good. So the saying goes. 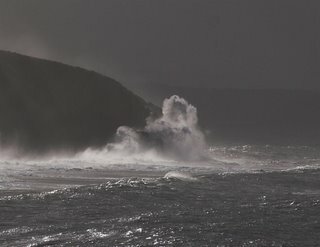 I journeyed down to Goat Bluff (opposite Betsey Island) this morning, mainly to see the much publicised swells that were coming in after the storm force winds of recent days. They were indeed worth watching and photographing, but as I know from previous occasions, it also brings in the sea birds, and I wasn't disappointed. Although admittedly, they are still some way offshore, probably around 1500metres or so, they are still identifiable. There seemed to be a large area of 'dirty' water around the NE of Betsey Island that was attracting, not only birds, but dolphins. 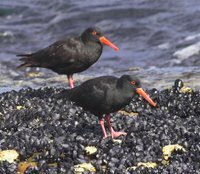 Birds identified included 5+ Giant Petrel, 3 Great Skuas, 1 Wandering Albatross, several Shy Albatross, 20+ Gannets, and several Black-faced Cormorants. The larger birds were passing through and no doubt if I'd stayed longer I would have seen more. Despite the enjoyment of seeing these birds, there was a strong, biting SW wind blowing! There were many more Gannets at the mouth of the Derwent River. 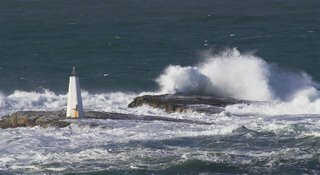 The photos show Black Jack Rocks Light and Cape Contrariety, complete with heavy swell, as seen from Goat Bluff. Black Jack Rocks is normally a favoured roosting site for Black-faced and Little Pied Cormorants and often holds 100+ birds. Before Summer becomes just a distant memory, I thought I would post my one and only image of a Golden Bronze-Cuckoo. Taken about 4 weeks ago, it suffers somewhat from the colour caste caused by the Native Cherry it was photographed in. If separating the bronze-cuckoos wasn't bad enough, I've noted that the 'golden' seems to have undergone periodic name changes. Called originally just Bronze Cuckoo, it later became the Green Bronze Cuckoo and , more recently the Golden Bronze-Cuckoo. 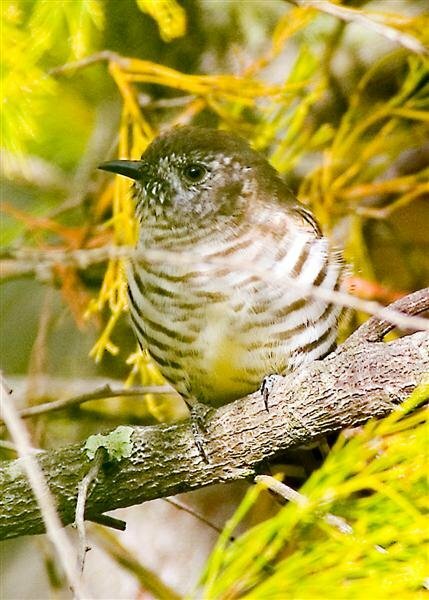 The Shining Bronze-Cuckoo, now widely accepted as a sub species of the Golden, had previously been called the Broad-billed Bronze-Cuckoo, to differentiate it from the Horsfield's, which was called the Narrow-billed Cuckoo. Phew!! Confused? I'm still not entirely clear where the present argument rests, particularly regards the sub species, 'Shining'. Early writers talk about its' presence here, and I note one writes(in the 1920s) "Considerable research yet needs to be done on the species of Cuckoos met with in this island". Shining had full species status at that time. 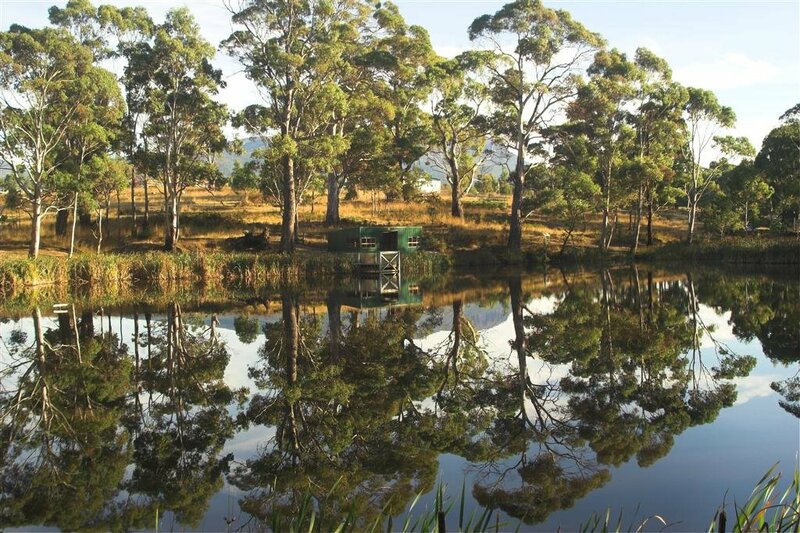 News from two Tasmanians in 'exile' ! 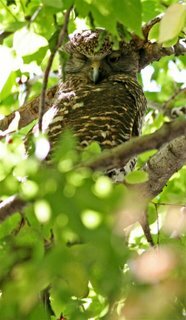 The accompanying photo of an owl--I believe it's a Powerful Owl, but my knowledge of Mainland owls is scant--was sent to the blog by Murray Lord. 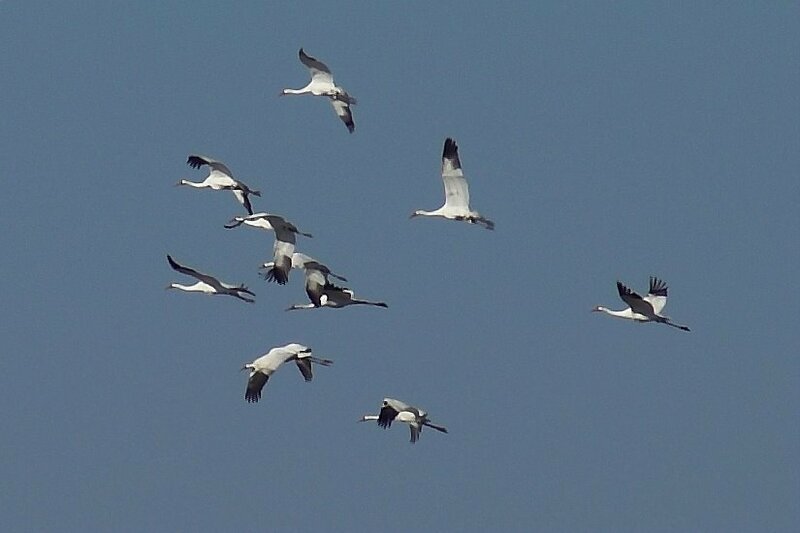 The image of birds in flight was taken by Matthew Fletcher in NE Illinois today. 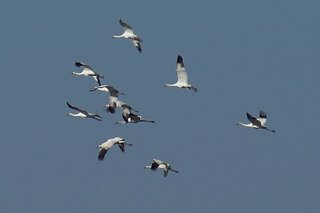 It depicts the rare, Whooping Cranes. 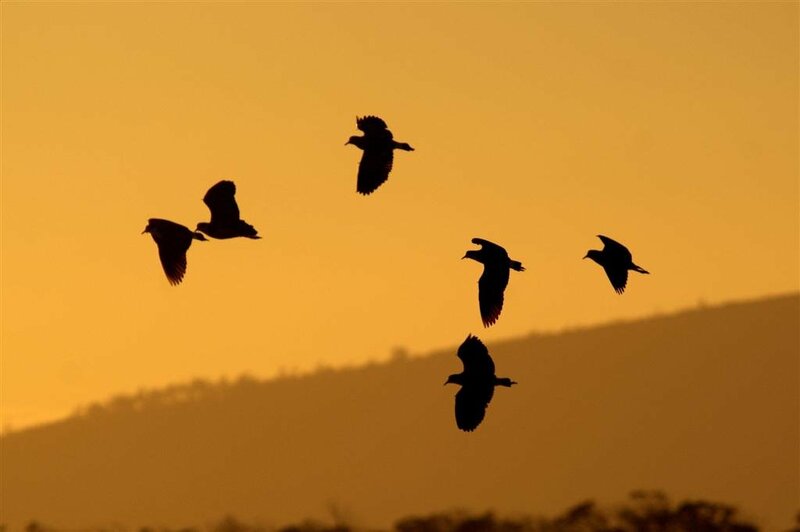 These birds are on their first return migration, all fitted with transmitters and followed by wildlife officers. There are less than 500 birds left and their presence sent a buzz of excitement through the ranks of birders in the area after Matthew reported them. He was fortunate enough to see them as they arrived. 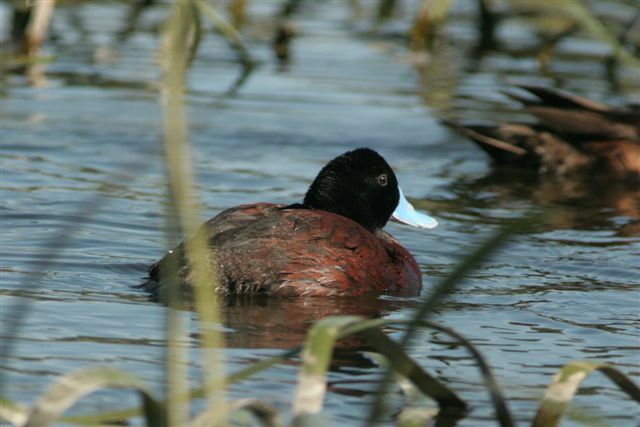 If you would like to know more, go to his blog--Illinoisbirds--which has a link on the right hand side of this blog. recognise as 'male'. It may however, breed while still at the 'brown' stage. Felix Wilson writes: Just a couple of pix of Purple Swamphen, taken out at Gould's Lagoon. John's pictures of the Spotless Crake, inspired me to send them in. I took them a couple of weeks ago out there. The Swamphens are interesting birds, having adopted Polyandry--that is the acquisition by a female of more than one male as a mate. 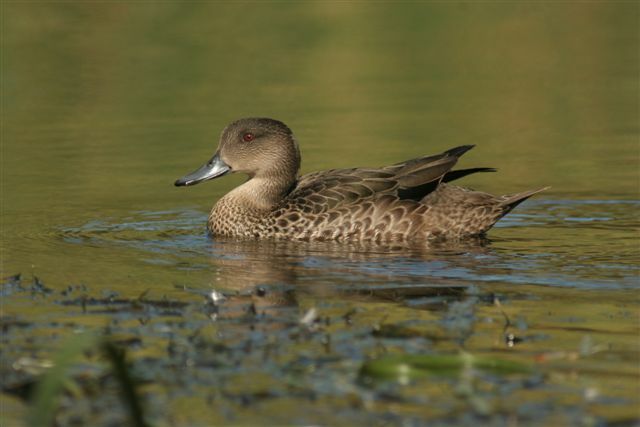 They are striking to look at too, though it is surprising how well those colours camouflage them in the reeds and rushes of the wetlands that they inhabit. No, I'm not closing the blog! 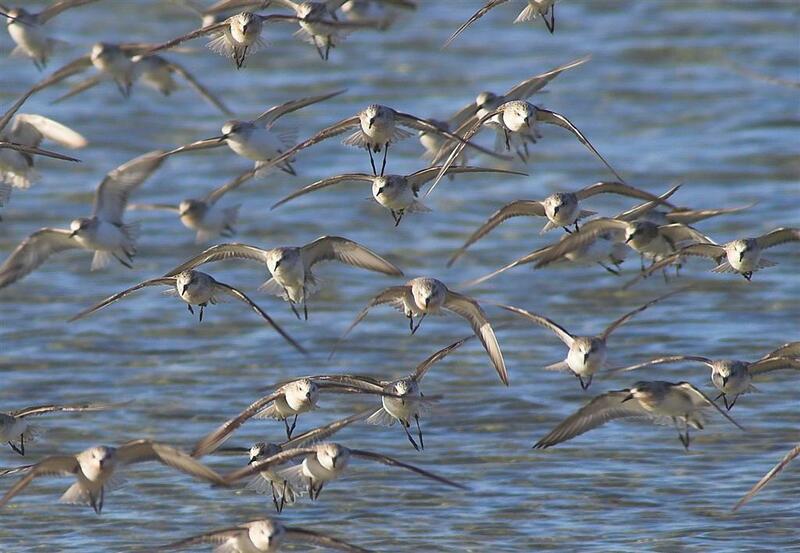 I'm referring to our soon to depart, migrant waders. 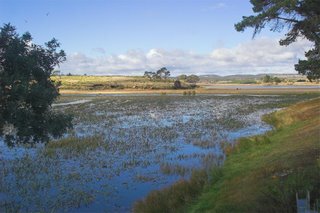 I took the accompanying pix a few days ago at Pipeclay Lagoon and I had hoped to capture them in all their Summer finery. 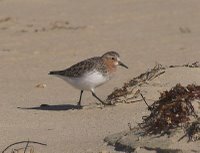 In fact most of the birds, they were mainly Red-necked Stint, showed only partial Summer plumage, mostly 'trademark' colour round their necks, as you can see (click on pix to enlarge). They were however, noticeably fatter--they'll increase body weight by about 60% or so-- enough to get them at least to Northern Australia-- before 'refuelling', on their way to Siberia. A few, mostly first year birds, will overwinter.